Our family loves burgers! But just a single patty on a plate is boring. Let’s stack on the flavor—literally. Lightly grilled red onion and thick pineapple slices under a grass-fed burger packed with classic Asian ingredients—plus a quick and easy 3-ingredient Teriyaki sauce on the side for dipping—make each bite a mouthful of anything but boring. I fell in love with Ciarra’s cookbook the moment I heard the concept! Frugal Paleo!!! 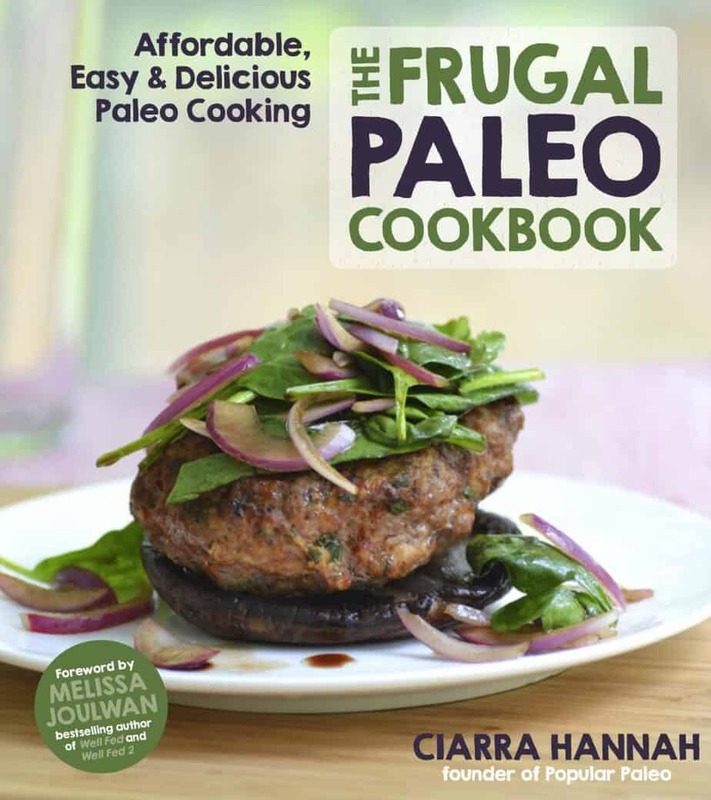 The two things that fill my heart with joy: frugal + paleo. I found the cookbook to be very approachable. I can see myself making ever recipe. I’ve even personally recommended the cookbook to a few friends and bragged about the simplicity of the ingredients. I wanted to share with you a recipe from the cookbook. First, mix together the burger patties and get them on the grill. In a large bowl, by hand, combine the ground beef, jalapeño, garlic, cilantro, kosher salt, sesame seeds and onion powder. Divide into 4 equal portions and shape into patties. 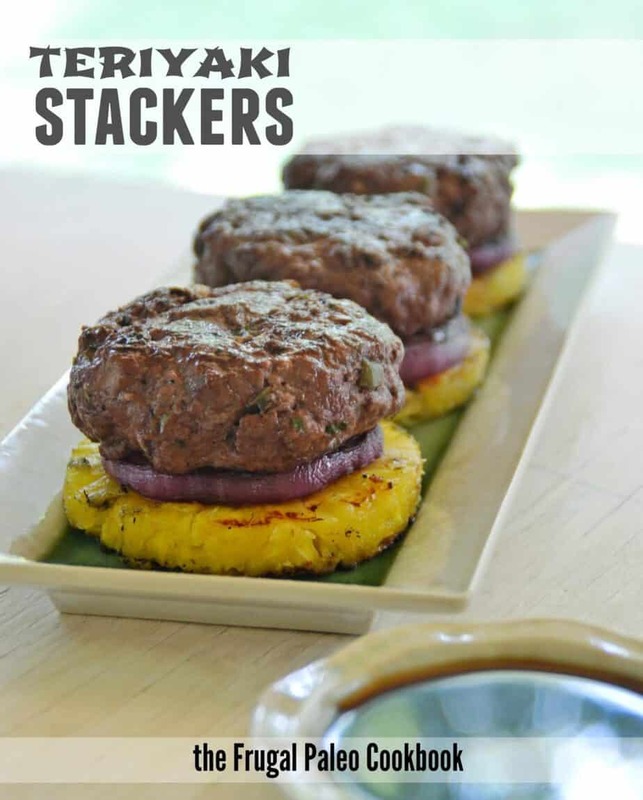 Grill the burgers to your desired doneness alongside the fresh pineapple and red onion slices. I like to grill the pineapple and onion for just 2 to 3 minutes per side, just to get the char marks but not enough to change them much, texturally speaking. While the grill is going, mix up the quick teriyaki dipping sauce. In a small bowl, combine the coconut aminos and vinegar, then stream in and whisk the honey to emulsify. Portion the dipping sauce into equal amounts for the number of people you’ll be serving and hold at room temperature. Grab the burgers, pineapple and onion off the grill. Stack the pineapple slices, then onion slices, then the burgers on your plates or serving tray and serve alongside the teriyaki dipping sauce. Eat these with a knife and fork, making sure to get each layer in every bite!